Nalini keeps Preventous Calgary health clinic running smoothly so we can keep you in peak health. The managing director of Preventous Collaborative Health, Nalini supervises the day-to-day operations and ongoing development of the centre. Nalini is passionate about good health. She has a Bachelor of Laws Honours Degree from the University of Wolverhampton, England, obtained in 1997. She was subsequently called to the Bar of England and Wales in 1998 and is a member of the Honourable Society of Lincoln’s Inn. Nalini is a world traveller. She has lived in Nassau, Bahamas, where she worked in the legal field while completing a series of legal courses. Her travels then placed her in Trinidad where she was admitted to practice as an Attorney-at-Law. She practiced for several years, primarily in the fields of family law, personal injury law and medical legal law, before moving to Canada in 2001. Subsequently she settled in Calgary where she completed the Alberta Bar Admissions course and has worked in both the legal field and the oil and gas sector. What’s a lawyer doing in a Calgary health clinic? 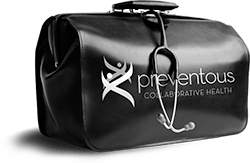 Nalini strongly believes that with the combination of skills possessed by the health professionals at Preventous Collaborative Health, Preventous can make a major impact, improving your quality of life immeasurably. It won’t be long before you get to know Georgie. Georgie is devoted to client relations at Preventous. She’s the person who will coordinate the health care team to ensure that all of your needs are met in an efficient, timely manner. You’ll soon discover that Georgie is well suited to her position. Experience helps. Her past employment includes the start-up of a family practice clinic in Edmonton, which she went on to manage. She’s also worked as the patient coordinator for eight years at a private medical clinic in Calgary, where she was involved in the management of staff. Georgie is easy to talk to. Your consultations with her will be invaluable in answering all of your questions about Preventous Collaborative Health. Born and raised in Calgary, Dr. Rohan Bissoondath has been practicing medicine since 1997. He has worked in various disciplines of medicine including Internal Medicine and Emergency Medicine. At the University of Calgary, Dr. Bissoondath completed a residency in Family Medicine in 2004. Dr. Bissoondath’s practice of medicine is based on combining current medical evidence with his well-developed clinical acumen. He brings a caring and compassionate attitude to each patient encounter. Early in his study of medicine in Calgary, Dr. Bissoondath began to appreciate the value of keeping people healthy. Now, after years of treating patients after they have fallen ill, he has set his focus on a proactive approach to health. As Medical Director of Preventous Collaborative Health, Dr. Bissoondath directs the medical portion of the initial health assessment. He subsequently contributes to the development, implementation and ongoing management of each client’s health plan. In addition to his work at Preventous, Dr. Bissoondath keeps active at various urgent care centres and rural emergency departments within the Calgary Health Region. His interests extend to overall health and fitness with a strong emphasis on healthy eating and regular physical activity. We couldn’t do all we do without Carol. Carol is the Administrative Assistant at Preventous Collaborative Health. She received her diploma in medical transcription from the Northern Alberta Institute of Technology. She brings over 25 years of medical office experience working in various medical facilities including family practice, walk-in-clinics, and specialty offices. Carol commits much of her personal time to supporting the sporting activities of her children. With over 30 years of medical experience, Darlene is able to answer your questions and provide advice during your visits to Preventous. Dedicated to providing clients with a pleasant and high-quality experience, she’s here to help in any way possible. Darlene’s extensive work experience includes geriatric care, working in the recovery room in oral surgery, and serving on the front line in medical and cosmetic offices. She has worked as a medical receptionist, administrative assistant and booking surgical coordinator in addition to providing bedside care. She has also volunteered with the Kelowna Ambulance service. A lifelong learner, Darlene has completed a knowledge nursing degree program and numerous courses, including advanced skills in business, mathematics, and accident prevention. When she’s not adding to her vast amount of knowledge, Darlene enjoys boating on the lakes of the sunny Okanagan with her family and travelling to warm exotic destinations such as the Dominican Republic and Mexico.